Award Wallet is the best way to track miles and points balances! 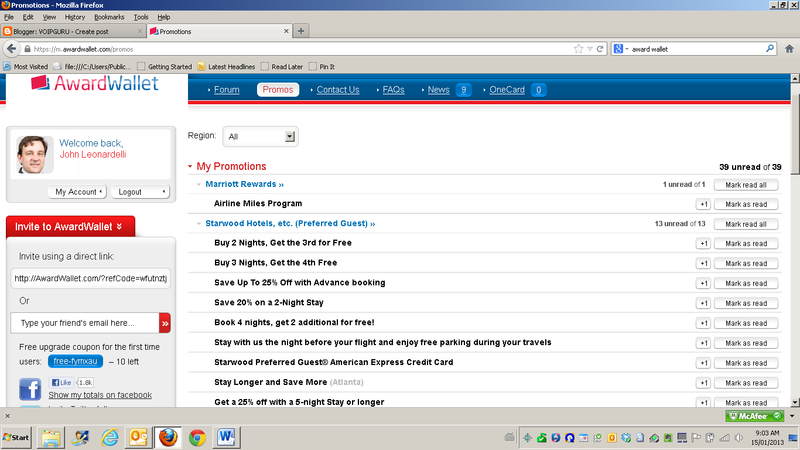 As a busy traveller it’s a pain to keep track of mileage rewards, hotel points and other rewards programs. In the past you may have needed to use a spreadsheet to maintain this entire but in the PCless era this task is no longer a chore. There is now a great app call Award Wallet. It not only keeps track of airlines, hotel programs, and car rental agencies, but also includes the most important information of when those points expire. I just need to choose my rewards programs and provide the log in details and the app will do the rest. It also sends out summary emails to let you know of any recent activity. You also can see this information using your web browser. Another cool feature is the One Card. Award Wallet will print your membership account numbers and the telephone numbers of all your programs. No need to carry 18 rewards cards in your wallet when just One Card will do. It also includes the information on the mag stripe on the back so you can use the airport terminal kiosk for check in. The other interesting feature I just found out about is that it can also link your Groupon and some bank accounts. I couldn’t get mine to work so I have to assume it’s a USA only thing for now. They also have a promotions tab on the web based log in and that will keep you abreast of any promotions being offered by the service. Award Wallet simplifies my rewards administration task immensely. If you want to try it out, Award Wallet has given me some upgrade codes for first time users.